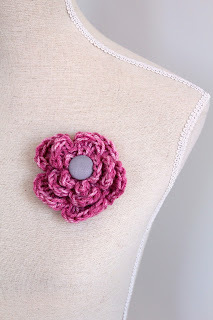 Crochet flower brooches - embellish away! Since it is spring now (or trying very hard to be! 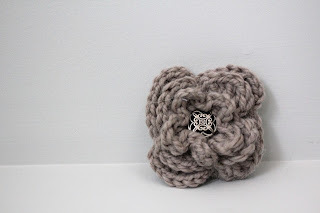 ), I have been racking my brain for cute but wearable items. 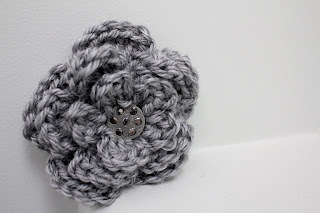 I had some ideas for loose and airy scarves...but then I started making flower brooches and they seemed to take over. 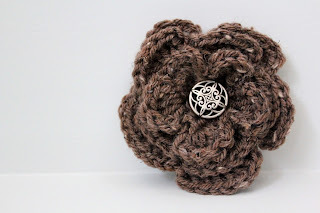 They are such quick projects but always so elegant. I have been playing around with different sizes of hooks and numbers of stitches to make them a little different from each other. I also make my own fabric covered buttons so I've been raking through them and creating some cute color combos. It's addictive. 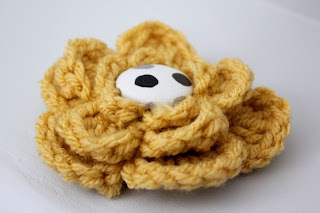 I added a latchback pin to the rear and a brooch party was formed! Personally, I think the yellow with polka-dot cloth button is the most adorable. You can buy any one of them on sale at my Etsy shop. 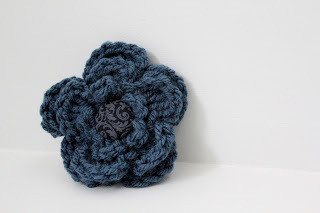 I've just learned to crochet flowers similar to these. They're so adorable. I LOVE the little buttons you've used for centers. The little buttons are fun because I get to play around with fabric patterns!